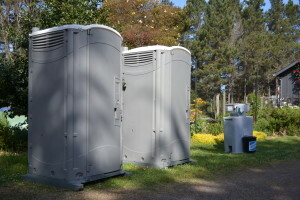 From the most elegant wedding, to a casual backyard barbecue, portable restrooms make rural gatherings possible. Our coastal residences and venues are served by septic systems and water wells. Large gatherings can overwhelm either system. 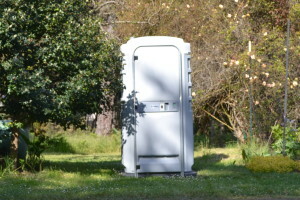 Besides being convenient for guests, portable toilets reduce water use, helping to keep the septic system from overload, and the well from running dry. A neutral, discreet taupe-gray color, your standard portable toilet will be delivered sparkling clean, and ready to use. 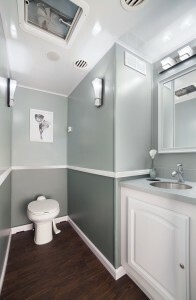 An upgrade from the standard restroom, the pale gray Fleet portable toilet has a nicely designed interior with an integrated sink, liquid soap, paper towels, and a solar light that comes on a dusk. 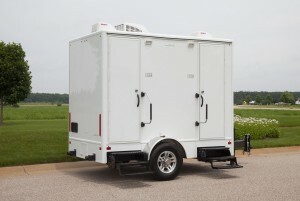 The largest of our portable restrooms, the roomy Deluxe has a flushable toilet. It includes a full length mirror, integrated sink, liquid soap, paper towels, and a solar light that comes on at dusk. Hand washing is vital in any event where food is served. The 2-station sinks are fully self-contained, with a large water tank, and come stocked with soap and paper towels. 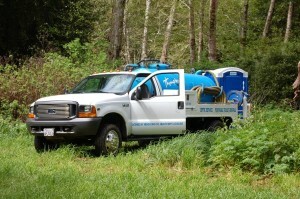 These are very cost-effective when grouped with 2 or more standard portable restrooms. The Spa Suite is the luxury option for your event. The men’s and women’s rooms are beautifully appointed and feature flushing toilets, electric lights, shelves for flowers and amenities, hot water, restful music…everything necessary to create a welcoming oasis for your guests.